From a patented process for embossing directly onto the petals of live fresh flowers to the ability to tap into diverse industries that have never used flowers before, Speaking Roses shows the world The New Way of Expression. The world is full of paradigms that tend to stifle progress. The tendency of human nature is to resist change. Speaking Roses has created a paradigm shift with a revolutionary product that can only be called The New Way of Expression. Speaking Roses has captured the attention of Hollywood celebrities, international media outlets, and mega events like Miss America, the Oscars, the Kentucky Derby, and the Rose Bowl. See for yourself in this impressive collection of video clips. This video shares a few of the ways you can combine the beauty of Mother Nature with heartfelt emotion to uniquely express yourself! Any of life’s events that deserves celebrating deserves Speaking Roses. From corporate events and marriage proposals to birth announcements and Mother’s Day, the addition of a rose with a message adds an emotional touch to the moment. Speaking Roses featured on media worldwide. Speaking roses in everyday life. Surprising television audiences and fans everywhere, Tom Cruise presented 225 Speaking Roses bouquets to an audience of well-deserving single mothers on the Ellen DeGeneres Show. 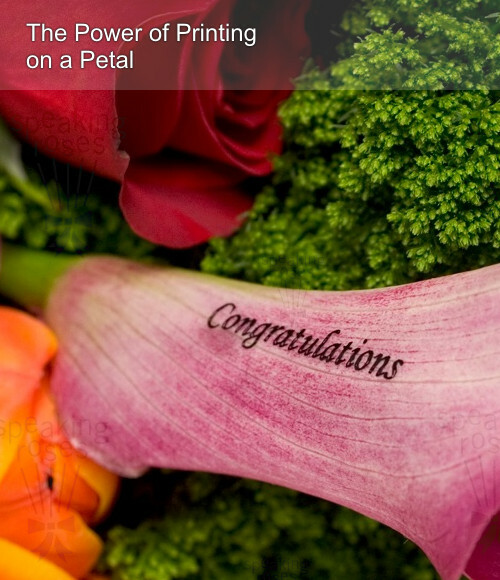 With our unique personalized flowers, it’s no wonder E! dubbed us the 2007 "number one cutest gift for V-Day!" Get an insider's perspective of whats going on in the world of Speaking Roses. The media buzz around Speaking Roses. Watch this brief video about the Speaking Roses headquarters, located in the spectacularly diverse landscape of the Western United States. In just a few years, Speaking Roses has risen to international acclaim, garnishing unparalleled public and consumer attention in both in-store and online sales. 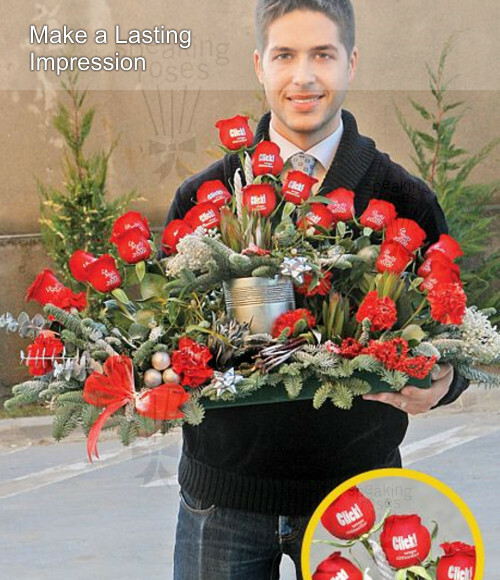 Speaking Roses received the "Distributors' Pick" award from the Promotional Products Association International (PPAI). We hold over one hundred patents and trademarks in countries around the world. We have identified a few fraudulent companies in the international markets who are contacting our potential customers. See what our customers have to say about our knowledgeable instructors, easy to comprehend material and online videos available 24/7. Take a product that practically sells itself and combine it with the Speakin Roses process, and you have huge market potential. Once you’ve completed your training, you’re still only a phone call or email away from our customer support department. We have created a user-friendly and extremely reliable flower printer using processes that are of the finest quality available anywhere in the world. This state-of-the-art and efficient flower printer does not apply a sticker or a decal. The flower printer actually embosses bright or metallic colored ink directly onto fresh petals at the rate of 6-10 roses per minute. It can also personalize wooden flowers, silk flowers, silk petals, soap petals, glass, ceramic vases, and so on. Our packages provide you with everything you need to get started, and are flexible enough to allow you to start small and grow extensively. To be contacted by one of our experts about becoming a Speaking Roses licensee, click here. By using a flower printer technology to emboss personalized messages and/or images on the petals of live flowers, Speaking Roses has fused the beauty of flowers and the message of a greeting card together. The opportunity to take advantage of a Speaking Roses license is being offered to you! You can produce customized, printed flowers for individuals and corporations in your area, as well as providing a personalized product that no other business opportunity can offer. Only the Speaking Roses license opportunity caters to the customization and personalization needs of today’s growing gift, greeting, flower, and promotional markets. Speaking Roses has created, patented, and developed a unique flower printer to screen personalized messages and images on fresh, live flowers. This new, stimulating way of expression is combined with human emotions and the glamour of flowers for memorable occasions. It fuses the greeting card market and the promotional industry. Our attractive speaking flowers have had an internationally auspicious response. Hollywood celebrities such as Tom Cruise, Donald Trump and many others have given or received our embossed flowers as gifts. 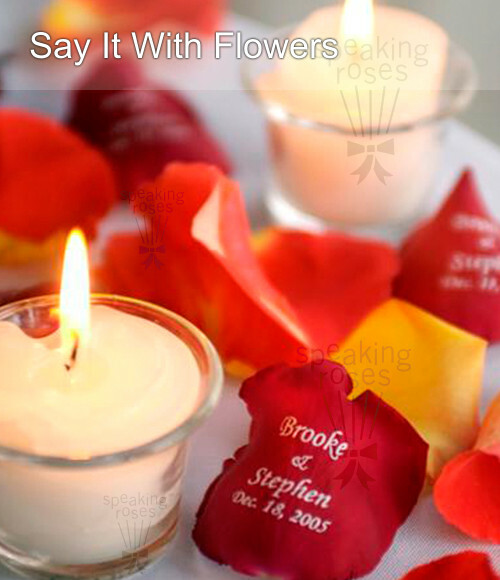 Speaking Roses printed flowers have been present at the Kentucky Derby, the Oscars, the Emmys, Access Hollywood, praised by E! Entertainment, and the Forbes and Family Circle magazines, among many others. Speaking Roses has been awarded and received international recognition at the 2005 International Horti Fair Floral Show in Holland, and was voted best product by the Promotional Products Association International. Speaking Roses offers you the profitable opportunity to become a licensee, and to produce and sell personalized screened flowers by accessing a flower printer. You will receive the necessary equipment to create or enhance your own business with comfort, autonomy and creativity. 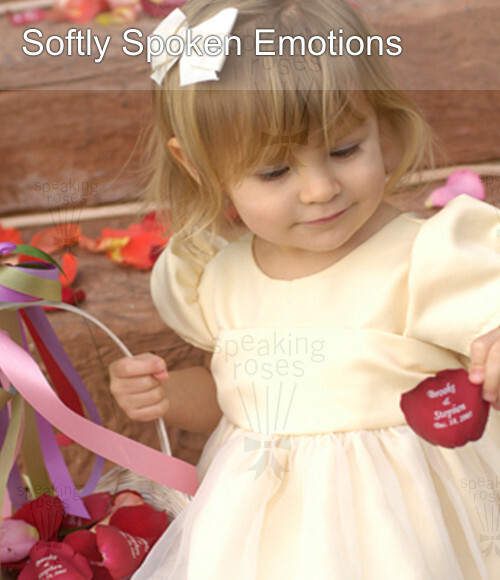 Your potential for growth with Speaking Roses is unlimited! When you join our team, you will have access to the "know how" of experienced professionals, and you will become part of a company that has already attained a worldwide presence. 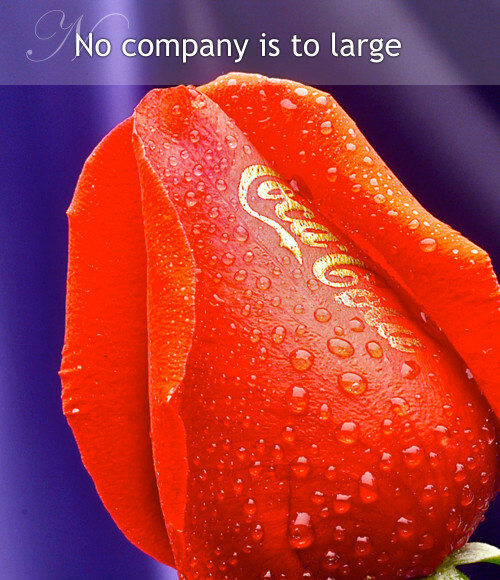 You will have the option of using our official Speaking Roses™ logo for legitimizing your personal business. Kentucky Derby are registered trademarks of their respective companies.